I cannot get enough pumpkin this time of year! I've had this recipe since college (thanks, Aubrey), and have made these pumpkin bars multiple times a year since then. I can only imagine how many of them I've consumed. Actually, I probably don't want to know. 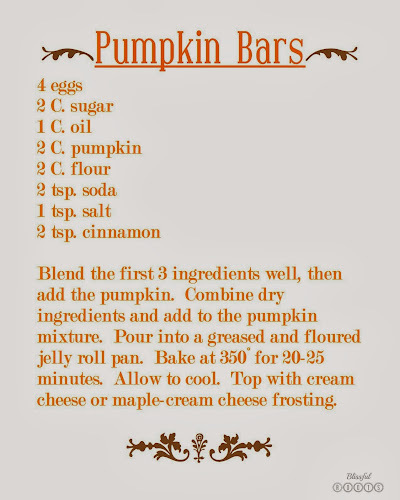 Last year, my sister introduced me to a recipe on The Brown Eyed Baker for pumpkin whoopie pies with maple-cream cheese frosting. She said I HAD to try them out. I did, and they were absolutely amazing! 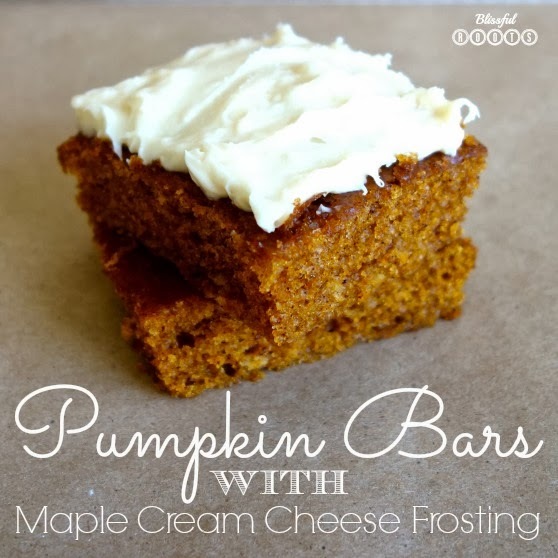 Well, this year I decided to try the maple-cream cheese frosting on Aubrey's pumpkin bars (her recipe calls for plain cream cheese frosting). I'm certain I'll never make the pumpkin bars without the maple frosting ever again. The maple takes the already delicious cream cheese frosting to a whole new level! So, so, so good! BTW, I use my homemade maple syrup in the frosting, but you could use store-bought syrup instead. Thanks so much for visiting, Marty! And thanks for the invite. These really are amazing! Enjoy your day! You are amazing! Can't say it enough! You've totally made my day, Linds. Look how cute your picture is! Love ya tons!